I originally thought that this could be easily detected by an environment variable, or even VB Script…but it turns out that those two methods are not reliable. The %SESSIONNAME% variable is set if you are on a terminal server. If you just RDP to the console of a workstation, or server – it is empty. As always, it contains no spyware or adware…only freeware goodness. It is free for commercial and personal use. Excellent utility steve. I happen to have the same issue here. I work at a bank that uses software that needs to run at logon to process items through the day. Once in a while someone forgets that they can’t RDP into this system, since it has that same logon script! Then bam, the batch processing crashes and an hour later we get angry calls. With your little tool I can stop this madness once and for all. I get an error with Windows 2000. Is it supposed to work with it? No, it won’t work with 2000. This is because it is lacking certain terminal service API calls. Yea, it is an old machine. It is a cisco 4.x call manager server. Not a TS. 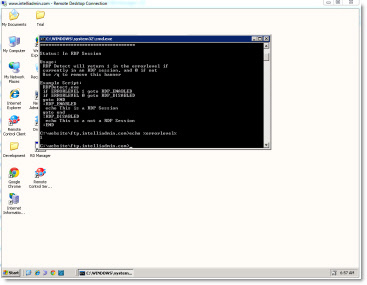 But since it is 2000 server, it has RDP built in. Great utility steve. I have run into this issue before. Thanks! Thanks for the free tool steve. Have a ctrix env here and this is a great little utility! I need a tool that specifies that system info like boot time,free disk space, server name on RDP Session background without logging into server. Please Can you do that for me?